Home » Equipping Men Blog » Is The Reach Of Your Men’s Ministry Wide And Deep? 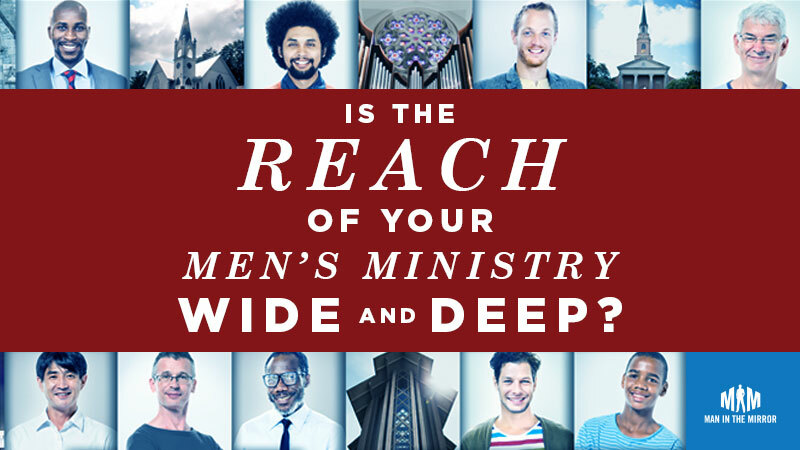 Is The Reach Of Your Men’s Ministry Wide And Deep? They worked hard to promote the event, and 80 guys registered, including 12 who were not very involved in the church and had never been on a retreat before. They had a businessman speak on a very practical level about how being a Christian affects your everyday life. The talks were short and had plenty of discussion time afterwards. In order to make the new men feel comfortable, they allowed the men to sit wherever they wanted during the sessions and discussions. They had lots of fun and competitive activities. And they offered a follow-up activity for guys to get involved in—smaller groups of men that would meet for six weeks to go deeper into the issues raised by the event. During the retreat, it seemed like guys were really getting to know each other. The discussion times were robust. At the end of the retreat, 60 men signed up for the follow-up, including eight of the twelve “fringe” men. A week or two later, the entire men’s ministry leadership team met to debrief, including the retreat planning team. The retreat team was excited to talk about their success and frankly eager for a few pats on the back. What they heard next blew them away. There were other comments about the speaker, scripture memorization, guided private devotionals and other “missed opportunities” from the retreat. The planning team was stunned. They had met every goal they had set for the weekend, yet the leadership team was ripping it apart. What went wrong? Making disciples is all about taking men who don’t know Christ and helping them become mature, passionate followers of Jesus. This journey can be represented by a path, or continuum: from “Men who need Christ” (WIDE) all the way to “Mature disciples” (DEEP). Your ministry to men will need to help men at every stage of this journey. We call this concept the Wide—Deep Continuum. Every man in your church can be placed somewhere on the continuum, and that determines the offerings that will appeal to him. As a man matures in his faith, he will move farther down the continuum. How could knowledge of this continuum have helped the leadership team from the retreat example above? First of all, the planning team could have shared their goals with the rest of the leadership team and gotten their buy-in. All disappointment is the result of unmet expectations. The leadership team had one set of expectations about the target audience for the retreat; the planning team had another. Notice that none of the suggestions that the other members of the leadership team made were bad. Teaching straight through passages of scripture, staying with the same group of men for deeper discussions, having longer personal times with God—these are all great retreat activities to deepen men’s faith. But there was also nothing wrong with the type of retreat the team actually planned. It all depends on where you are aiming on the continuum. You will interact with men at all points along this continuum. On the left side—the “wide” side—are men who are not all that interested in spiritual things. To reach guys on the wide side, you need activities that reach them at their point of interest. These are activities that require little or no preparation and low commitment. Typical activities at the wide end are softball teams, BBQ’s, a Super Bowl party, golf, hunting, fishing, etc. To reach men on the deep side, you need activities that meet their spiritual needs more deliberately. These activities probably have a connection from week to week; they require preparation; they’ll go deeper into Biblical concepts; they will offer accountability and transparency; and their focus will be on more mature Christians. Typical activities might include small groups, Bible Studies, leadership training, service projects, or spiritual retreats. No activity you do can meet the needs of every man in your church. In our illustration of the retreat above, the retreat planning team was focused on reaching guys more to the left of this continuum, while the rest of the leadership team were hoping for something reaching guys on the right of the continuum. 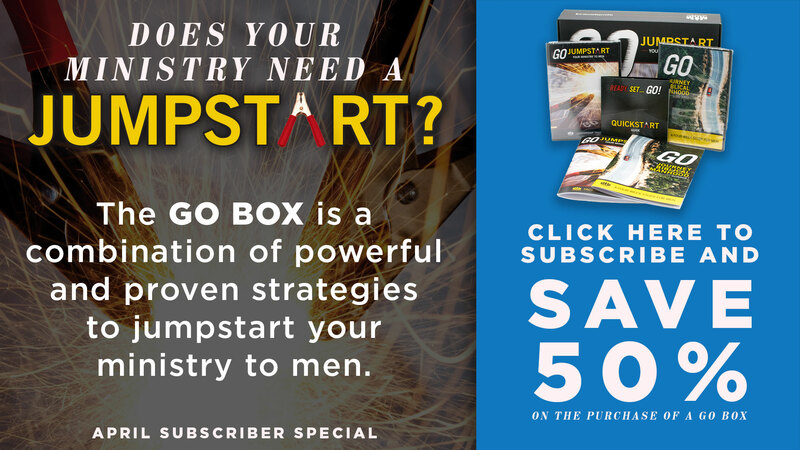 As you plan, make sure you are offering a range of activities that will interest men all across the continuum. You’ll need different types of activities to reach the different types of men in your church. The Big Idea: Build a seamless process in your church using different activities to reach the different types of men across the Wide—Deep Continuum. Also, be sure your leaders are clear about your target audience. If you’re like most churches, you’ll have leaders passionate about men at different points along this continuum. Left to their own devices, your leaders will naturally tailor events to their passion and calling. Help them understand the purpose of the event so they can support the agreed upon agenda of the team. Different leaders will be passionate about reaching different types of men. As an example, consider this hypothetical situation: It’s Sunday morning and your men’s ministry leadership team has just finished a prayer time before the services. An usher approaches and tells your team that two men are in the lobby asking for someone to talk to them. One man has wandered in off the street. He is not sure why he is there, but he seems a little down and said that he is looking for answers. He wants to know what this Christianity thing is all about. The second man has been involved in the church for a while. Due to personal circumstances in his work and marriage, he really wants to take his relationship with Christ to the next step. He wants someone to talk with him about how to study the Bible and pray. Quick! You have to choose only one. Which man would you rather go talk to? Some of you reading this book have a heart for evangelism. Your desire is to reach out to lost souls and point them towards the cross. Others are more drawn towards helping Christian men build the Kingdom of God. You like to help men understand what it means to study God’s word and pray. In every class we teach, about half of the leaders want to talk to the man who is seeking Christ for the first time, while the other half feel drawn to talk to the man who is seeking a deeper relationship with Christ. Think back to the continuum. Men at the left side of the continuum are seekers, trying to find their way to Christ. Men on the right side are leaders, wanting to follow Christ more closely and serve him. Most leaders are wired to work with men at a certain point on the continuum. When you grasp this concept, it can help save a lot of trouble and misunderstanding. The pastor explained that he would go out into the community and meet new men and convince them to give the church a try. But every time a new man walked in, his men’s ministry leader would talk to them, invite them to join a small group, and explain the importance of accountability. “As fast as I could get new guys in the front door,” the pastor said, “they were running out the back.” Understanding the continuum helped them realize that their hearts were for men at different places. The layman now realized that every man has to go through a process. They’re not always ready for accountability and transparency. He and the pastor agreed to develop an appropriate process to move men along the continuum. Your ministry includes all the activities and interactions that your church has with men. It’s these interactions and activities that engage men and help them move forward in their spiritual journey. However, not all of these activities have to be men’s only activities driven by the traditional idea of a men’s ministry. We will talk more about this concept in the next post.